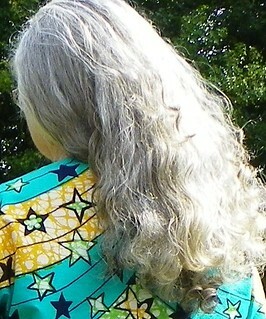 Folks have commented about my hair since I’ve started blogging about sewing and modeling the garments again. Honestly, it’s kind of difficult to get the focus on the garments when there’s all this wild silver/gray/brown/blondish stuff flying around. Most like it a lot and some have curly hair that kinks out too much in the humidity, too. I hope the story of my journey helps any one who needs it. Let’s start at the beginning: I had hair, then I lost it and now I’m trying to get it back. Here’s the backstory. This is me at 40, in 1990. My hair is cut short on top (I had found it hopeless to try to grow it out all one length) and long in back to the middle of my back. I used nothing more than shampoo, conditioner and setting gel (it might have been dippity-do LOL) and then waited 2 or more days for it to dry. It rarely looked this tidy! As years passed and our business demanded more travel I started having it done weekly as I couldn’t take the time to do it myself and do the traveling our business demanded. It had grown to my waist and was frankly a horrible, bushy nuisance. I had bad reactions to most hair straighteners and colorants but Aveda didn’t seem to be so bad so I found a good Aveda stylist in town. He colored it, cut it short and pressed it straight so it was less eccentric. That worked for work. He styled me like a screen siren, let me tell you! But by the next week I was looking pretty limp. But cancer came along in 2007 and half of it fell out. Nobody noticed it much because I had so much of it. 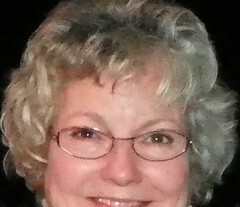 I stayed ill and frail for a couple of years after I was declared tumor free. I looked dull and exhausted all the time. I learned quite a bit about my hair from my salon experience: it’s very delicate, thin and fine but with thick growth, and frizzes completely in the back when I sleep with it down against the pillow. Being in the sun oxidizes it so it breaks off on its own with nothing more than a half day in the sun. But it seemed to be thinning at a rapid pace and my scalp itched like crazy all the time. I switched shampoos but that didn’t help. My stash of blue tint stuff ran out. I was losing all my hair AGAIN and in misery with the itching so I stopped rolling it and that really didn’t change anything. I studied all the Plopping Techniques (you’ve heard of Plopping, haven’t you? that cracked me up!) and read all the chat boards about how to handle natural curls. I was getting by but not thriving. Thank the Lord for the burst of products of the market and information on the internet, too. Sure isn’t like the first 45 years of my life! and breakage from working out in the sun so little spirals were sticking out all over! I started rolling it again so it was more workable, wrapping it up if I was outside, keeping it in a french twist so it wouldn’t tangle and massaging coconut oil into my scalp. The itching stopped immediately! For the past month if I feel tangles, I slick up the stands with coconut oil on my hands and gently pull and stroke a small clump of hair until it is smooth and straightened, using my fingers and nails as a gentle comb. Then I’ll smooth and twist the stands into a curl and move on to the next area. I only use the comb if I am going to try to put it up on my head and only after I have gotten out as many tangles as I can find. Using this Hands On Method (pun intended) I discovered that the ends in the back were not softening with the oil treatment and I trimmed about an inch off in the areas that seemed rough as best I could. Someday I’ll find a hair dresser that I trust again and go have it professionally evened up. Someday. Not yet. weather permitting. It’s not worth the time it takes to roll and sit under the hair dryer if it rains like it has for the past week. If it’s still stormy weather I’ll wash it, lightly oil it down with some setting gel added in and let it dry naturally. I tried the Moroccan Oil (Argan oil) but it seemed to give even more of a yellow tint and didn’t seem to absorb in my hair like the coconut oil does. Hopefully I’ll be able to grow all my hair back, keep the length and survive in a humid climate. I’ll spare you the rant about what it’s like being the only white girl around with wild curly hair in the segregated South of the 50-60’s and having to be groomed by other whites who had no respect for nor understanding of how to care for curly hair. Nope, I won’t say another word. But I do love coconuts! Posted in Beauty, Blogging, Cancer, Curly Hair and tagged beauty, Cancer, Coconut Oil, Curly Hair. Bookmark the permalink. I’ve seen you and your hair in person, and you have GORGEOUS hair! I wish I had your curl. I lost all my hair thanks to chemo, and I decided not to dye it when it grew back. Go gray!! Another product I’ve tried and really like is a fibre paste, Un.Dressed, by Kevin Murphy. I used it with wet hair and coconut oil and let it dry naturally. But it is very expensive. I save it for special occasions only! I use oil in my hair. It makes a huge difference. I wash my hair at night and sleep on it, no braiding, no pony tails. The humidity here rises to 65%+ at night, and it is dry by morning, even when it was down to my waist. I put the oil in my hair in the morning, and I have never had a problem with it not absorbing in milliseconds. I never use a dryer. It takes friggin’ forever to dry my hair with one. I have a couple of varieties, one that I got at the grocery store marketed to African American women and one that I got at a fancy smancy craft fair. Both work well; the fancy smancy one smells like apples which I like. I’ve also used olive oil and mayonnaise. I was out of the other product for the former, and the latter was an experiment. For me, the key is differentiate between my scalp (very oily) and my hair. It takes practice, but it is possible to oil your hair and not contribute to the oil that runs into your eyes after not washing your hair for 25 hours. I get lots and lots of compliments on my hair. While I’m lucky to have been born with fabulous hair, I’ve also learned how to work with it, not against it. 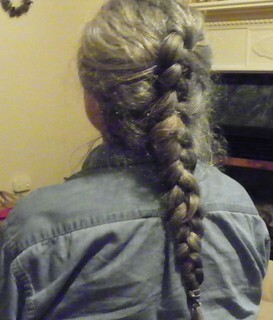 Mary Beth, my youngest daughter has hair similar to yours. (She is 18.) She has had it chemically straightened a few times, but doesn’t do that anymore. Her main technique these days is to use coconut oil. It was hard for me to be of much help to her, as I have thin, limp hair and not much of it. I like to color my hair for a number of reasons, but one is because it gives my hair more texture. 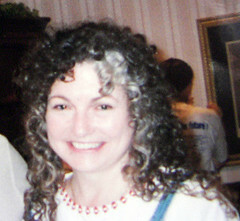 I have curly hair, too, and it took me decades to figure out how to take care of it. When I was in college I rejected it completely by shaving it all off! Thank goodness there’s more knowledge available now for the curly haired–my mother still can’t shake her 50’s childhood training of brushing (and therefore breaking) her curly hair. Well, I think you arrived beautifully. I like, besides coconut oil, using Shea Moisture Raw Shea Butter Restorative Conditioner (you can find it at Target, where it goes on sale regularly). I use it as a leave in conditioner; I wash my hair at night and let it dry naturally, and I sleep with it kind of wet sometimes. This conditioner defines my curls, makes them soft and shiny and really smells good. I think your hair is gorgeous and I would love to have it. Like everything else in life that is worth it, it does seem to take work. I am totally jealous. 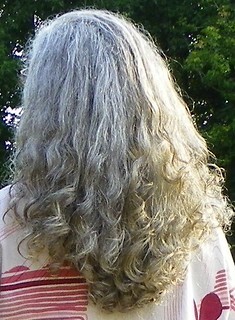 I perm my hair bi-annually for 75 – 100 a shot, which I won’t complain about next time. I also live in a humid climate (at noon it was 90 with 56% humidity) and have a problem controlling the frizz. I will look for something with coconut oil in it. Becki, everybody’s hair is different. Some say coconut oil is too heavy for my fine hair and shea butter would be better but it works for me, esp in detangling which is the major cause of breakage for curly girls. Coconut oil helps and moisturizes but doesn’t control those frizzes so maybe for you the solution would be different. I love your hair-it is so sensual. It was interesting to see the progression of styles, and changes due to chemo and your hairdresser. 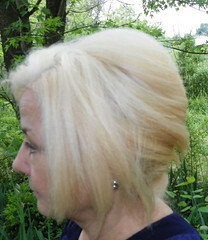 FWIW, I also got “blonde” hair after a hairdresser tried to add a clear rinse. Never again. I have straight hair so no oil on my hair for this girl. Ooh! I am extremely jealous of all you curly girls. I have fine straight hair and not enough of it. Mary Beth, your hair always looks wonderful to me, though I appreciate the tangling problems as when my hair was long it tangled badly and since it was so fine, was hell to untangle and not break. Now it’s grey, I’ve got highlights, something I could never do when I was younger as I was afraid of dyeing it and losing it all. So for me greying has been fun. Glad you have sorted out your itchy scalp problems. Coconut oil is wonderful, and you have reminded me to try it again. See if it will strengthen my hair up a bit, too. Thanks for your always interesting posts. Trish, graying is fun! But we gray ladies do get different treatment from those who color, eg: cute “gentlemen of a certain age” winking in the grocery store 🙂 Re coconut oil: I use it on the dog’s dermatitis, as well so we’re sharing the jar. Is soothes her allergic skin itchies right down. You’re right, sometimes nice to be a young oldy! And gentleman of a certain age+ often have a really good line in flirting. Thanks for sharing your amazing hair story. Your hair is beautiful. I use coconut oil & olive oil for my hot oil treatment. When my hair was a lil longer I used coconut oil more often, now with it short, I primarily use as a hair treatment. 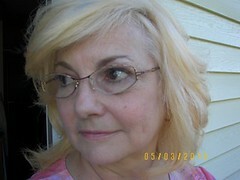 Mary Beth, thanks for sharing your hair back story. My first and continuing encounter with you has been through the Internet and our sharing of the love of sewing. I have only seen your hair styled and coiffed, always thinking how lovely and thick your hair was. I never knew that you had curly hair. I have been seeing the longer, curly look of late and was wondering where all that curl came from, who knew!!! I have always had a lot of fine, straight hair which holds moisture for hours. I have always had multi-colored hair naturally and women have asked over the years who did my highlights and I have always said “God”. I have gone to gray in multi shades and about a year ago some of it turned greenish/yellow like from too much chlorine in the pool. My hairdresser bleached out some of the greenish strands and turned it more golden and slowly but surely it is getting cut out every 7 to 8 weeks. I still don’t know what caused this, probably some styling chemical or our city adding more chemicals to the water. No matter how you wear your hair, I for one am glad to see you sewing and posting again. Hey Linda, yeah, we’ve been trying to post our pictures and model our garments online for what? over 10 years now? I’d say we “grew up” together, in a sense, within this sewing culture. I had noticed your hair go through a radical change in the past year. I wondered at the time what the heck could have caused it. Glad you’re recovering from…maybe a business trip and new city water in a hotel somewhere? I’ve had weird stuff happen with those environments. Now you’re as beautiful and even more graceful than ever. Keep on, hey? Mary Beth, first, let me say how courageous I think you are. You have been through a lot and have come through a survivor. Bravo! I think your hair is beautiful. I used to have poker straight, fine hair, even when I bleached it blond in my later teens (think Mary Travers ofPeter, Paul and Mary). I was religious about using hot oil on it, to keep it from breaking. 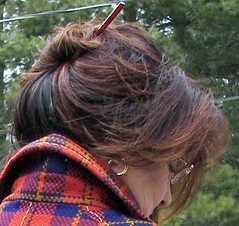 Eventually, I had it colored back to my normal shade (mouse brown), but it was still straight and perfect for the “wedge” when Dorothy Hammil started skating into our hearts with that fabulous hair. 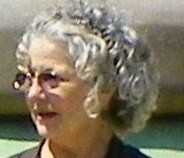 In 1980 I had a C-section and after tha- t, my hair started to get thicker. I still got perms, but they lasted longer for some reason. In 1996 I had a hysterectomy and then the real fun began. 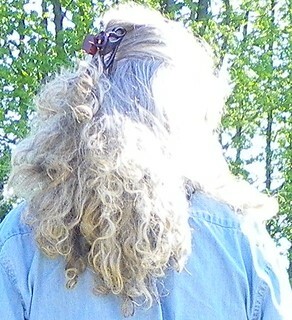 It started with one side of my hair getting curls – curls my hairdresser thought were residual from a perm, but I knew otherwise. By 2000 all ends were curling (still rather flat along the crown though). 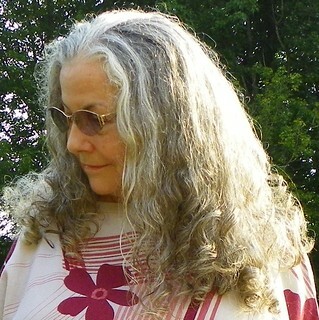 Now, as gray as I am, people remark about my fabulous thick hair and waves. My hair is coarse now and harder to manage, so I can relate in some small degree to what you are dealing with. For itchy scalp I use ketokonazole shampoo three times a week and it keeps things under control. 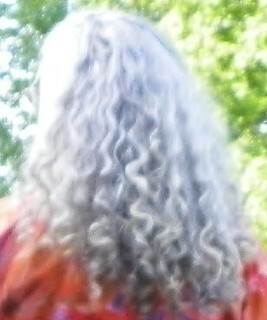 I hope to find a shampoo or rinse that will make my gray more silver. There are days I long to be blond again but just cannot get into that financial responsibility. There are other things on which I would rarther spend any extra I have. Nancy: Do you have a fungal problem and that’s why you’re using a ketokonazole shampoo? I tried that route with no help (on both me and my beloved dog) and we found that the coconut oil and a shea butter conditioner from L’Occitane were the only things that soothed the itchies. 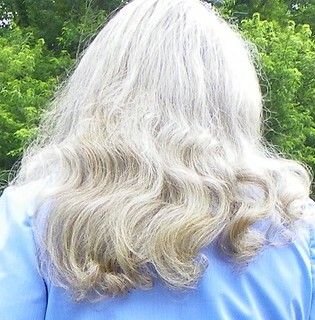 How lucky are you to now have a gorgeous mane of silver hair! In my research I found that a violet based shampoo is the best for me because I still have brown in the mix. Right now I use Pantene Silver Expressions only a couple of times a month, and the Silver Expressions Conditioner weekly as a co-wash. I think it is a better color than the blue based shampoo I was using. I have commented on your hair before. I love it like this. Natural and wild. Very attractive. 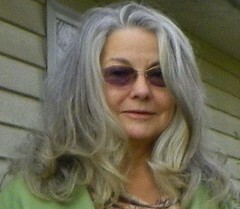 Love your hair with silvery curls, Mary Beth! Very beautiful! I hated my curls until I found that large curly hair communities on the internet and learnt how to take care of it. There is a book called “Curly Girl” which helped me too – on how to handle curly hair. Also there are curly hair salons sprouting in many places these days. Ouidad has some nice hair salons for curly hair. Expensive but so worth it. Your hair is so stunning, MB! What I wouldn’t give to trade my limp, straight locks for your gorgeous ringlets. Another friend just recommended coconut oil to me too. I guess I’d better get some! You have beautiful hair – both color and curl. After all you’ve been through, you definitely earned it. Mine is that blah middle place between blonde and brown and doesn’t take to curling, or much styling at all. I used to color, and even more many years ago perm. I gave up perms (25-30 years ago?) when the last one gave me chemical burns and fried my hair severely. I gave up coloring because I was tired of keeping it up. Now I just let it grow, and when it gets too much, I hang on a bit longer until it’s long enough to donate, then get it cut. Then start growing out again. Every time I donate, I wonder if it’s the last time, or if the grey will be too much by the next time.